The Wyoming Whiskey mission is to produce Wyoming’s first premium whiskey, using regional ingredients, through a select process that promotes Wyoming’s natural and human resources. “It’s a sultry smooth dram which would make even the good ol’ boys in Kentucky proud.” READ MORE. “The absolute best American craft whiskey distillery that distills all of its products and is not owned by a multinational conglomerate.” READ MORE. “…Since they already made one of the better small batch regional whiskies in a sea of products hit with a tidal wave of mediocrity, it’s not surprise that this new release is delicious as well.” READ MORE. Wyoming has been traversed by many historic trails, notably those made famous during the 19th century’s opening of the West. But now, in the 21st century, Wyoming has become the western terminus of the ‘Bourbon Trail.’ READ MORE. Wyoming Whiskey makes one of the top bourbons outside of Kentucky, and it’s one of the best kept bourbon secrets anywhere across the country. The wheated bourboon is aged for over five years in full-size barrels, making it one of the more mature craft bourbons out there, with a rich, sweet profile offering caramel and char. This one is priced to move but it’s flying under the radar. READ MORE. What’s Wyoming’s terroir? That’s the question Brad and Kate Mead posed to David Defazio in 2006, when the husband and wife told Defazio of their plans to open a distillery called Wyoming Whiskey. READ MORE. Halfway between Wyoming’s Shoshone and Bighorn National Forests is the tiny town of Kirby (population 92). Kirby, WY is just up the road from the Wind River Reservation in the Bighorn Basin. It’s almost four hours from the buzz of Jackson Hole, arid, rugged, and wide open. READ MORE. Only 111 bottles of this barrel-strength Bourbon came from two casks filled in 2009 and bottled in 2015, and the nose is intense, but still buttery-smooth with a nice oakiness, vanilla, Turbinot sugar, orange blossom honey, caramel candy, fudge, and muted touches of clove and nutmeg in the background. READ MORE. It all starts innocently enough. An email exchange. Me: Hi, I want to write about your whiskey. (Ulterior motive? I love whiskey—especially whiskey of the bourbon variety. You can’t blame a girl for loving whiskey.) Them: Great. Let’s make it happen. READ MORE. A couple of years back while skiing at my beloved Jackson Hole Mountain Resort, I tried the local whiskey in one of the many area bars that serve it from tiny casks. READ MORE. Perhaps nothing is more symbolic of the Wild West than whiskey. From John Wayne asking for a bottle of whiskey in Rio Bravo, to Augustus McCray espousing to glories of it in Lonesome Dove, it is universally recognized as the drink that helped win the west. So it seemed only fitting that Wyoming, the “Cowboy State” should have it’s own whiskey. READ MORE. At first glance, the story of Wyoming Whiskey rings as all too familiar. Locally sourced, locally crafted, locally bottled, etc. READ MORE. 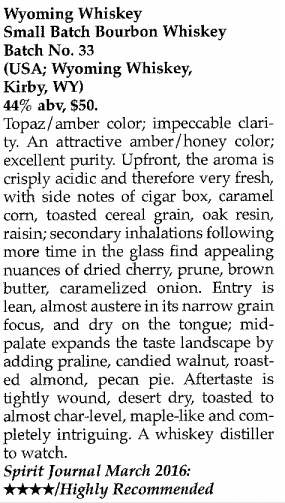 Topaz/amber color; impeccable clarity… A Whiskey distiller to watch. READ MORE.